WILMINGTON, Del. (CNS) — As a native Philadelphian, I’m proud of the city’s Independence Hall, the Pennsylvania Statehouse that became the birthplace of the United States when the Founding Fathers approved the Declaration of Independence there in 1776. The lightning of history struck the building again, in 1787, when during what’s been called the “Miracle at Philadelphia,” a federal convention there produced the resilient Constitution of the United States. 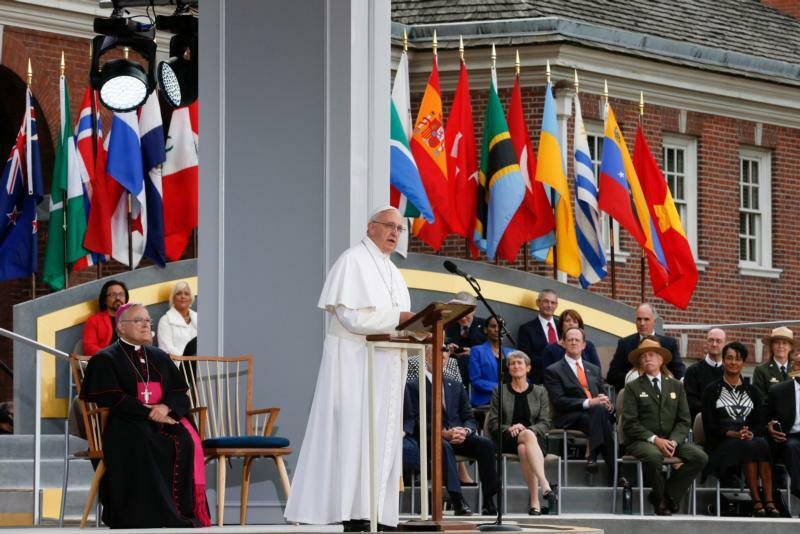 When Pope Francis spoke Sept. 26 at Independence Hall about religious liberty, he mentioned Philadelphia’s founding by the Quakers, led by the Society of Friends’ William Penn, who established religious tolerance in his colony. With the pope spoke on religious freedom at Independence Hall, it was easy to wonder how many Founding Fathers would have been appalled by the “pope of Rome” being welcomed to speak to the U.S. Congress or in front of the hall. When Al Smith, a Catholic governor of New York, ran for president in 1928, and even when John F. Kennedy ran in 1960, anti-Catholic bigotry was stirred. But Francis spoke to Congress and even uttered a prayer, “God bless America,” and the country did not become a Vatican state. Speaking of the pope, religious liberty and Independence Hall, I was privileged to attend a prayer service at Independence Hall in 1983. That’s when members of Catholic Press Association gathered for a convention in Philadelphia and we were welcomed into an “upstairs room” in the Hall by the National Park Service. The prayers were led by Archbishop Stephen Sulyk, then head of the Ukrainian Catholic Archdiocese of Philadelphia. The park’s service representative told Msgr. John P. Foley, the editor of The Catholic Standard & Times back then, that the journalists’ prayers in the long gallery marked the first time in its history that Independence Hall had been used for a prayer service. Next time I accompany friends from out of town to Independence Hall, I’ll glance at those stairs up to the now off limits second floor and credit the Catholic Press Association for paving the way for another Catholic event at the Hall’s front door 32 years later — Pope Francis’ address. The pope last week echoed both Penn and the First Amendment during his speech when he stated, “I would like to reflect with you on the right to religious freedom. It is a fundamental right, which shapes the way we interact socially and personally with our neighbors whose religious views differ from our own. The U.S. bishops have been concerned about religious liberty for several years because they want to maintain the right of faith to be exercised in the public square beyond church walls and private spheres. If the pope addressing Congress is a milestone of religious tolerance on a large federal stage, it becomes diminished, the bishops would note, when religious exercise appears thwarted by public policy, such as the contraceptive mandate in the Affordable Care Act. When Pope Francis visited with the Little Sisters of the Poor in Washington last week, Father Federico Lombardi, a Vatican spokesman, said that visit was a sign of support for the sisters’ lawsuit against the Obama administration’s mandate that employers offer contraceptive coverage in health plans or participate in a religious “accommodation” that the sisters have refused. So U.S. courts are now deciding if religious liberty “transcends places of worship,” and if the First Amendment’s prohibition against restriction on the free exercise of religion applies to the imposed contraception mandate. Religious freedom has an impressive history in the United States; it will be interesting to see what happens next. Maybe there should be a prayer service at Independence Hall. Ryan, editor/general manager of The Dialog, newspaper of the Diocese of Wilmington, is a former president of the Catholic Press Association.